This mid terrace home will be well suited to the young professional or investor alike. Offering bright and spacious accommodation, the home has been well presented by the current owners. The internal accommodation offers living/dining area with wood burning stove, kitchen with casual dining area, two bedrooms and bathroom. 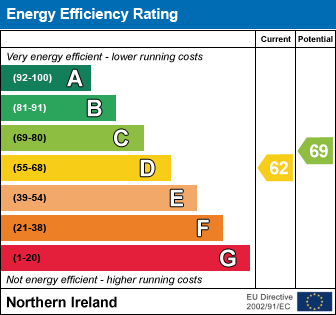 Gas fired central heating and uPVC double glazing are added benefits. Outside there are patio areas to the front and rear. Please contact our Lisburn Road office on 028 9066 8888 to arrange a viewing at your convenience. uPVC entrance door with glazed panels and fan light. Wood strip flooring. Part wood panelled walls. Solid wood floor. Multi fuel stove with stone hearth. Under stairs storage. High and low level units. Ceramic sink with mixer taps. Space for cooker. Extractor over. Space for fridge. Plumbed for washing machine. Part tiled walls. Ceramic tiled floor. Door to yard. Panelled bath with mixer taps and hand shower over. Low flush WC. Pedestal wash hand basin. Fully tiled walls. Hard wood cupboard enclosing gas fired boiler. Part wood panelled walls. Access to roofspace. Wood strip flooring. Decorative fireplace. Patio to front. Covered yard to rear. Check out the property I found on PropertyPal.com: 228 Ravenhill Avenue, Belfast BT6 8LL.